For the earlier treaties between Japan and Korea in 1905, see Japan–Korea Agreement of April 1905 and Japan–Korea Agreement of August 1905. The Japan–Korea Treaty of 1905, also known as the Eulsa Treaty or Japan–Korea Protectorate Treaty, was made between the Empire of Japan and the Korean Empire in 1905. Negotiations were concluded on November 17, 1905. The treaty deprived Korea of its diplomatic sovereignty and made Korea a protectorate of Imperial Japan. It was influenced by Imperial Japan's victory in the Russo-Japanese War in 1905. In the metonymy Eulsa Treaty, the word Eulsa or Ulsa derives the Sexagenary Cycle's 42nd year of the Korean calendar, in which the treaty was signed. The treaty is identified by several names including Second Japan–Korea Convention (Japanese: 第二次日韓協約, Korean: 제2차한일협약, 第二次韓日協約), Eulsa Restriction Treaty (Korean: 을사늑약, 乙巳勒約), Eulsa Protection Treaty (Japanese: 乙巳保護条約, Korean: 을사보호조약), and Korea Protection Treaty (Japanese: 韓国保護条約). Following Imperial Japan’s victory in the Russo-Japanese War, with its subsequent withdrawal of Russian influence, and the Taft–Katsura Agreement, in which the United States allegedly agreed not to interfere with Japan in matters concerning Korea, the Japanese government sought to formalize its sphere of influence over the Korean Peninsula. Delegates of both Empires met in Seoul to resolve differences in matters pertaining to Korea’s future foreign policy; however, with the Korean Imperial palace under occupation by Japanese troops, and the Imperial Japanese Army stationed at strategic locations throughout Korea, the Korean side was at a distinct disadvantage in the discussions. On November 9, 1905, Itō Hirobumi arrived in Hanseong and gave a letter from the Emperor of Japan to Gojong, Emperor of Korea, asking him to sign the treaty. On November 15, 1905, he ordered Japanese troops to encircle the Korean imperial palace and threatened the emperor in order to force him to agree to the treaty. On November 17, 1905, Ito and Japanese Field Marshal Hasegawa Yoshimichi entered the Jungmyeongjeon Hall, a Russian-designed building that was once part of Deoksu Palace, to persuade Gojong to agree, but he refused. Ito pressured the cabinet with the implied, and later stated, threat of bodily harm, to sign the treaty. According to 한계옥 (Han-Gyeok), Korean prime minister Han Gyu-seol disagreed, shouting loudly. Ito ordered the guards to lock him in a room and said if he continued screaming, they could kill him. The Korean cabinet signed an agreement that had been prepared by Ito in the Jungmyeongjeon. The Agreement gave Imperial Japan complete responsibility for Korea's foreign affairs, and placed all trade through Korean ports under Imperial Japanese supervision. 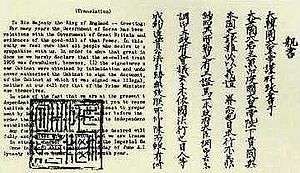 This treaty deprived Korea of its diplomatic sovereignty, in effect making Korea a protectorate of Imperial Japan. The provisions of the treaty took effect on November 17, 1905, and it laid the foundation for the Japan–Korea Treaty of 1907, and subsequent annexation of Korea in 1910. 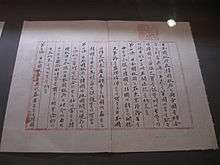 Gojong's analysis of the "treaty of 1905"
In 1907, Emperor Gojong sent three secret emissaries to the second international Hague Peace Convention to protest the unfairness of the Eulsa Treaty. But the great powers of the world refused to allow Korea to take part in the conference. Not only the Emperor but other Koreans protested against the Treaty. Jo Byeong-se and Min Yeong-hwan, who were high officials and led resistance against Eulsa treaty, killed themselves as resistance. Local yangbans and commoners joined righteous armies. They were called "Eulsa Euibyeong" (을사의병, 乙巳義兵) meaning "Righteous army against Eulsa Treaty". This treaty, later, was confirmed to be "already null and void" by the Treaty on Basic Relations between Japan and the Republic of Korea concluded in 1965. In a joint statement on June 23, 2005, officials of South Korea and North Korea reiterated their stance that the Eulsa treaty is null and void on a claim of coercion by the Japanese. As of 2010, South Korea was seizing property and other assets from the descendants of people who have been identified as pro-Japanese collaborators at the time of the treaty. ↑ Korean Mission to the Conference on the Limitation of Armament, Washington, DC, 1921–1922. (1922). &pg=PA35 Korea's Appeal , p. 35, at Google Books; excerpt, "Alleged Treaty, dated November 17, 1905." ↑ Kodansha encyclopedia of Japan, Vol 4, 1983, p. 289; "Ulsa is the designation in the sexagenary cycle for the year corresponding to 1905"
1 2 을사조약 (in Korean). Naver/Doosan Encyclopedia. ↑ "Deoksu Jungmyeongjeon". June 23, 2008. Retrieved May 4, 2009. ↑ Uk Heo, Terence Roehrig (2010). South Korea Since 1980. Cambridge University Press. p. 9. ↑ "Independence leader Kim Koo". April 28, 2008. Retrieved May 4, 2009. 1 2 Lee Hang-bok. "The King's Letter," English JoongAng Daily. September 22, 2009. ↑ "Treaty on Basic Relations between Japan and the Republic of Korea". "It is confirmed that all treaties or agreements concluded between the Empire of Japan and the Empire of Korea on or before August 22, 1910 are already null and void." ↑ Julian Ryall (July 14, 2010). "South Korea targets Japanese collaborators' descendants". telegraph.co.uk.